Have you ever really wanted to do something but didn’t quite get to it? Visit a new city, cut your hair, or maybe learn a new language? Perhaps the “it,” whatever it is collecting dust on your bucket or dream list? I’m there right with you. There is at least one item I am excited to note that is no longer on my bucket list! Haha! I have wanted to do this since I was 17 years old. I had the heart to do it at 17, but my employer and most property’s in the gaming/hospitality industry forbade employees from wearing one. The casino industry was very strict; the industry closely monitored and controlled employee’s appearance. I learned early to comply and respect the industry’s standards or expect termination. Probably for about a year now, the urge has repeatedly resurfaced. So this year on my 40 something birthday, I decided to do it. I got my nose pierced!! Yay! My brother, two cousins and my daughter provided moral support before and during the piercing. “I use a needle.” “Oh boy! !” screams my cousin Curtis. He is a 40+ year-old man who is not afraid to admit his fears. Okay so I birthed a child naturally without medication, and I realize the absurdity of fear of a two to three-second pinch. Lol! I sat through the process using the breathing techniques that I learned over 20 years ago in a birthing class. Was it painful? Not really. A pinch that lasted less than five seconds. 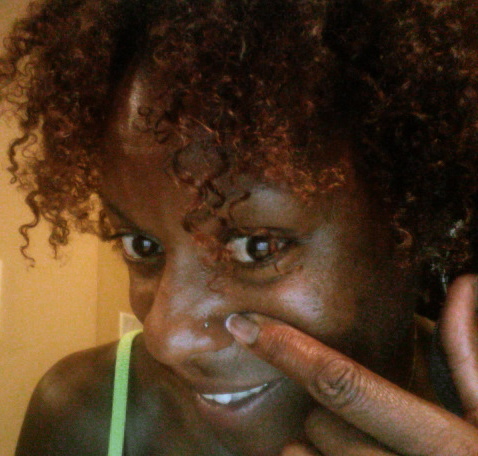 Was the nose ring worth the time and the pinch? Absolutely! I love it! Of course the day after the piercing, my allergies badly flared up and I had to figure out how to blow my nose with a fresh piercing. Ha-ha! There are people, like my mother, who will say, “You’re too old for that!” That’s their hang up not mine. I will stay on the path of being true to myself, while enjoying as much of each day as humanly possible. The joy and laughter infuse my life with a sense of peace for which I am grateful. This entry was posted in Family Living, Inspiration and tagged birtday gift, body piercing, bucketlist, collecting dust, nose piercing, piercing. Bookmark the permalink. Yeah! Good for you. Enjoy your piercing. Too old? No way… I am happy for you! I know you are gorgeous with it! Thanks Shawn! I wish that I had done it sooner. I am wearing the ring well.